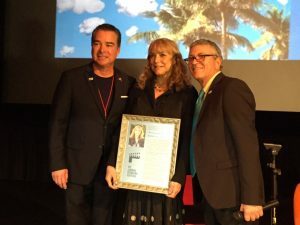 Karen Allen receives Lifetime Achievement Award at he Directorial Debut A Tree A Rock A Cloud. A delicate Zen like passing of wisdom from an older man to a young boy when they meet by chance in the early morning hours at a roadside café in 1947. Based on the short story by groundbreaking southern American writer Carson McCullers, written when she was just 25, the film, “A Tree. A Rock. A Cloud.”, is set at a roadside café in the early morning in the Spring of 1947. A young boy and an older man meet by chance. The man relates a luminous tale of personal heartbreak and loss, and of his hard won understanding of the nature of love. The film is the directorial debut of award winning NY actor/director Karen Allen.